Buckwheat is also known as common buckwheat, Japanese buckwheat or silver hull buckwheat. 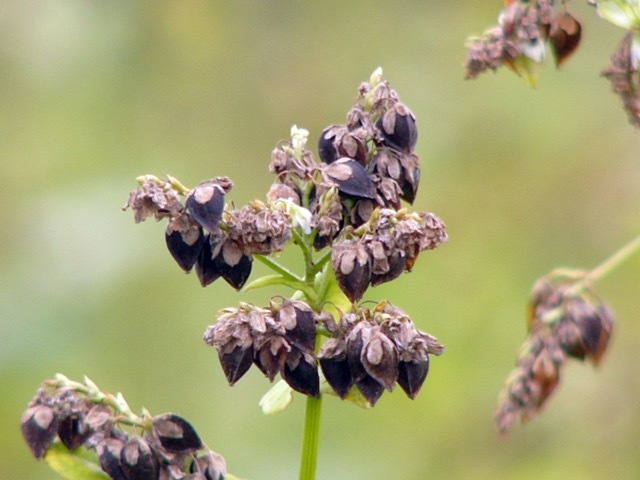 Buckwheat is an edible seed that comes from the dried fruit of the species Fagopyrum esculentum, which is an annual growing up to 1.5m (5ft) tall. it belongs to the dicotyledonous family Polygonaceae together with Rhubarb (Rheum rhabarbarum), sorrel and knotweed. Buckwheat is not related to wheat and neither is it a true grain, because it does not belong to the grass family (Poaceae, Gramineae), like other cereal grains. It’s referred to as a pseudo-cereal (false cereal) or pseudo-grain (false grain). Buckwheat is cultivated for its triangular, grain-like seeds, called, buckwheat groats, that come from the dry fruit called an achene. The fruit has one single seed, which is covered by an in-edible grey to black hull, which has to be removed (de-hulled) before the seed can be used. 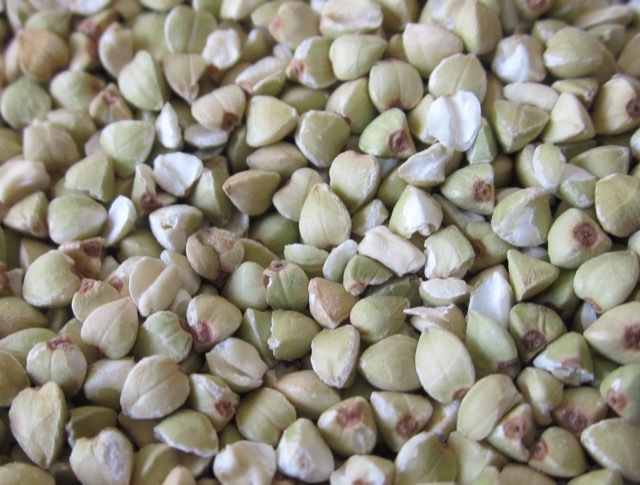 The photo below shows organic buckwheat groats (seed). They are usually pale green but can be toasted. Toasted buckwheat is known as Kasha and is brown in colour. Most of the buckwheat groats utilized as food for humans is marketed in the form of flour. The flour is generally dark coloured due to presence of hull fragments not removed during the milling process. Kasha (Whole, Toasted Buckwheat Groats) and Light Buckwheat Flour. Buckwheat flour is used primarily for making buckwheat griddle cakes and pancakes, and is more commonly marketed in the form of pancake mixes than as pure buckwheat flour. (Alternative Field Crops Manual). 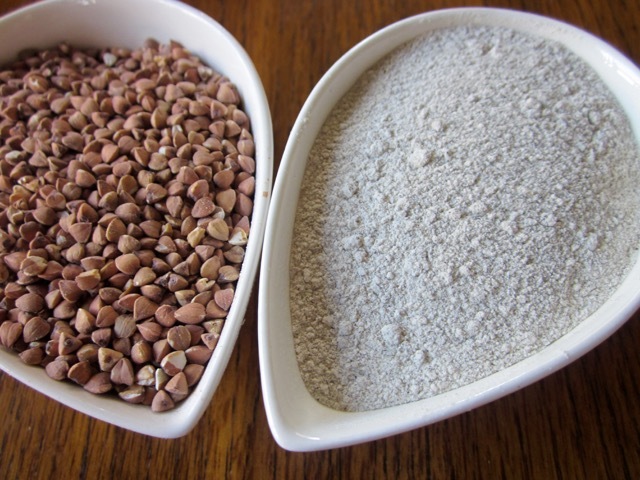 Pure buckwheat flour can be light, dark or sprouted. The dark flour is called as Blé noir (Black Wheat) in French. Buckwheat pancakes are eaten in several countries. They are known as Blinis in Russia and galettes in France. They have an earthy and mildly mushroom taste. Buckwheat flowers are very fragrant and attractive to bees that use them to produce a special, strongly flavoured, dark honey. Canada is known for its “Canadian Buckwheat Honey”. Buckwheat is a short season crop which grows 10-12 weeks. It thrives in well drained, low fertility soils but can also do well on acidic soils. The addition of too much fertilizer, especially nitrogen has been proven to decrease its yields considerably. It’s hardly affected by diseases and pests but has lower yield compared to true cereals.The presence of pollinators greatly improves its yield. Presently the largest producers are Russia, China, Kazakhstan, Ukraine, Canada, USA, Poland and Japan. Buckwheat fruits are first de-hulled. This means that the inedible black hull surrounding the seed is removed, resulting in pale green seeds. The pale green seeds are also referred to as ‘white groats’. 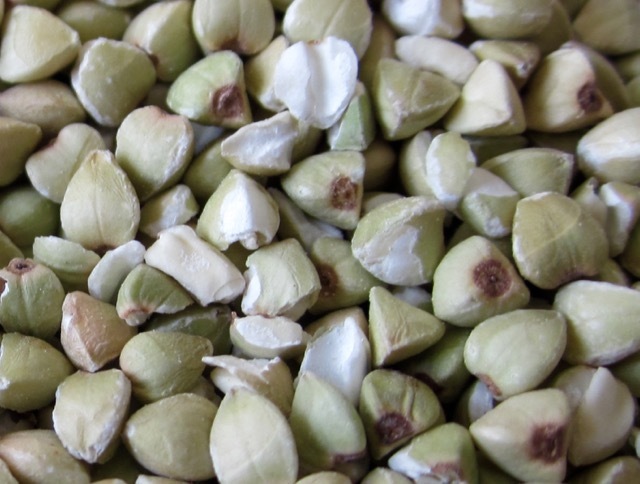 The de-hulled pale green seeds are sold as organic buckwheat groats in Canada, and have a mild flavour. If they are stored for a long period of time, the pale seeds gradually turn light brown in colour. To get maximum flavour and give the seeds a longer shelf life, they are usually toasted until they turn brown in colour. The toasted seeds have a more assertive and toasty flavour. They are referred to as whole toasted buckwheat groats or simply referred to as Kasha. The whole toasted groats can also be ground into flour or cracked into coarse, medium or fine granules. The processed buckwheat seed, also known as whole groats, is mostly made up of a white starchy endosperm, composed of 71-78% starch (25% amylose, 75% amylopectin), 18% crude proteins and 3.4% fat. Buckwheat has a high percentage of all nine essential amino acids, especially lysine, tryptophan, threonine, phenylanine, valine, leucine, isoleucine and methionine. It’s also rich in B vitamins as well as the minerals, phosphorus, magnesium, iron, zinc, copper and manganese. (Research Press). 100g (3.5oz) provides the following RDA for Magnesium (65%), Manganese (62%) and Phosphorus (50%). It’s also a good source of Linoleic acid, one of the two essential fatty acids we must have to be healthy. Since buckwheat is not a grain, it’s naturally gluten free, which makes it an ideal food for people on gluten-free diet. It’s important to read food labels because flours may become contaminated with other grains during processing. Due to it’s high fibre content and nutritional value, buckwheat is gaining importance as a health food. Buckwheat has a strong nutlike flavour, especially when toasted. The toasted whole buckwheat groats or Kasha can be cooked until they become soft and fluffy and served like rice. Buckwheat groats can be ground into a gluten free flour. The buckwheat flour can be mixed with wheat flour or other flours and used to make noodles, pancakes, muffins, cakes, porridge and biscuits. In America the flour is popularly used to make pancakes because it is gluten free. Buckwheat groats can also be cracked into coarse, medium or fine granules and used to make a side dish like rice, or used to make porridge or used as a cereal depending on the size of the granules. Buckwheat is also used as an ingredient in breakfast cereals. Buckwheat porridge is popular in Eastern Europe. The tender shoots of the plant make a palatable green leafy vegetable. Pure buckwheat flour is not good for baking bread because it lacks gluten which is necessary for the dough to rise. It also has a fairly strong, bitter flavour that can easily overwhelm a recipe. 30-50% buckwheat flour can be mixed with wheat, barley or rye flour to improve the taste and nutritional value of yeast breads. Buckwheat flour is used to make bread in China. In Himalaya, buckwheat is processed into alcoholic drinks. 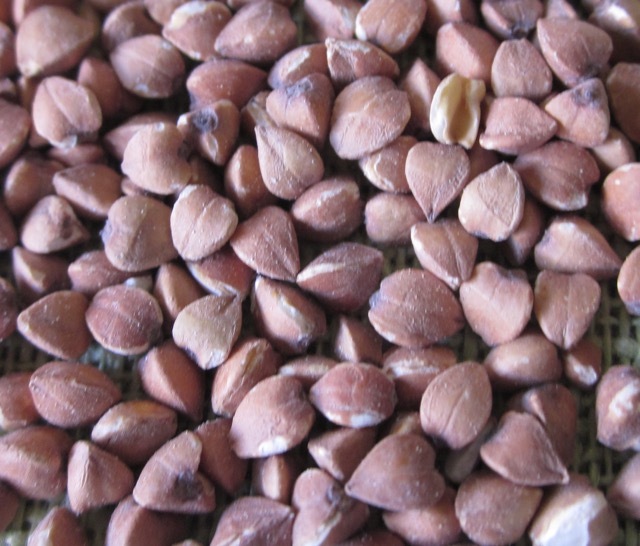 The seed is used for livestock and poultry feed. Buckwheat is also grown as a fodder crop, green manure and cover crop. The word kasha also refers to soft food made from cooked buckwheat or similar grain, like wheat, barley, oats, millet and rye. Want to Read More About Buckwheat? Prev What is Whole Black Gram (Urad Dal)? Next What is Vanilla Extract (vanilla essence)?